Famous for her hands on research, Tara earned her PI licence, was set on fire by Hollywood stunt company West EFX and choked unconscious by Ultimate Fighter ‘Big’ John McCarthy for this latest novel. She also descended into the Catacombs of Paris, and immersed herself in the world of burlesque, vaudeville, contortion, and magic, researching with magician Adam Mada. Watch the newly revealed cinema ads for Siren. Grand Guignol ‘Theatre of Fear’, famous in Paris in the early 1900s? And what of the rumours of violence and tragedy that have plagued the troupe for the past decade? Is their horrifying past fact or fiction? As always, Moss has produced a thriller of epic proportions which gallops along…In a word: Excellent. 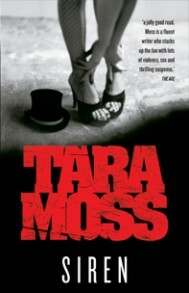 Tara Moss once again proves she is an emotional and driven powerhouse…From the outset Siren draws the reader in…It’s a dark and twisted tale that keeps you on a nervous edge throughout, elevating the psychological factor and inviting the reader in with sickly intrigue. Excellent stuff. The model turned-writer brings us book number five | and it doesn’t disappoint. Tara’s known for going to great lengths to add realism to her thrillers (including being choked unconscious, set on fire and training with a SWAT team), and this novel shows the same attention to detail…. Glamorous and menacing, Siren will please Moss’s female fans. Satisfying.